There will be no more music. I don't love you anymore. Your child didn't make it. What is the air velocity speed of a sparrow? I was the 486th person to take this week's Monday Meme! I had a good weekend! The art gallery night went well and the party Saturday night was a blast. 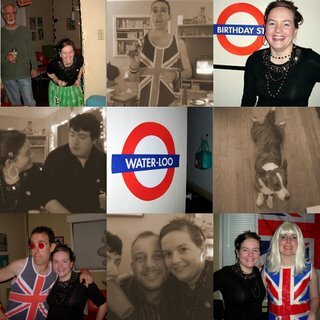 Here is a collage of the pics I took at the party. Like I said it was British themed so there were different outfits, signs and decorations that really made the theme awesome! The couple wearing Union Jack is the couple who threw the party (I am pictured with each indiviually on bottom right and left) I did my best to look like Lily Allen but her hair is much longer than mine so I had to improvise on the hair. The only food of your five that I have ate are frog legs . They tasted like chicken! However , I don't eat them now that I have grown up and I am not a silly little child anymore !